Our friends & brothers from Bristol Lodge are hosting an afternoon with Scott Wolter, host of H2’s America Unearthed and forensic geologist. 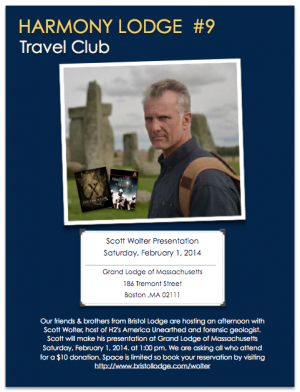 Scott will make his presentation at Grand Lodge of Massachusetts Saturday, February 1, 2014. at 1:00 pm. We are asking all who attend for a $10 donation. Space is limited so book your reservation by visiting the link below.